One of my favorite parts about moving to the Pacific Northwest is the abundance of wild mushrooms. Though I haven’t gone out to forage them myself they are readily available at our co-op. I hear if you look in the right places you may even stumble upon some of the magic variety. I have always loved mushrooms but growing up in California the only fresh mushrooms I was really exposed to were white, crimini, portobello, and shitake. The other mushrooms I had tried were dried, frozen or served at restaurants but they just weren’t the same as working with fresh ones yourself. 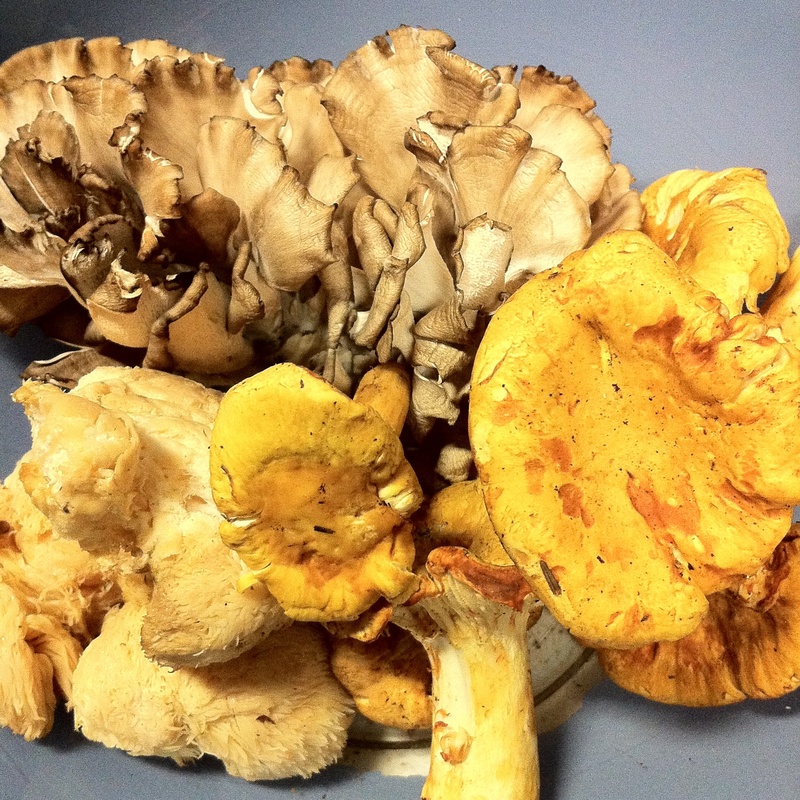 Now in the spring we look forward to royal trumpets and in late summer early fall we get chanterelles, Lions mane, oysters, and maitake “dancing mushrooms” to name a few. 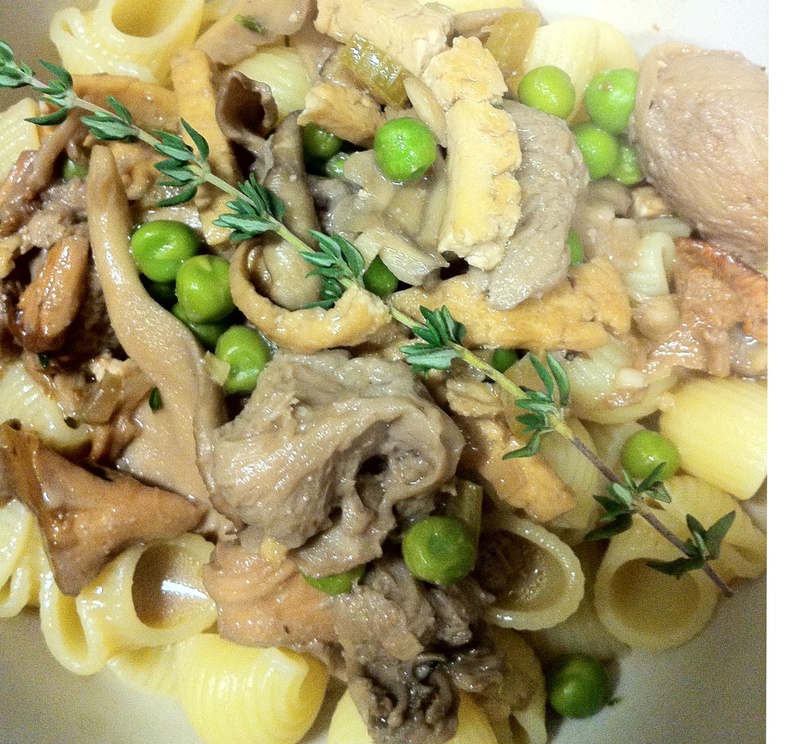 A special thank you to hubby who bought the selection of wild mushrooms for this dish. I prefer to tear the mushrooms up for a more rustic look but you may dice them or slice if you prefer. You may also use the mushrooms of your choice as long as the weight is the same. The Now and Zen Epicure by Miyoko Nishimoto Schinner is the first vegan cookbook I owned after my mom made me the tofu bacon out of it. Hubby and I have both been making our own versions for the past ten years. For this recipe I wanted it to have a slight apple flavor. Slice pressed tofu in thin strips. 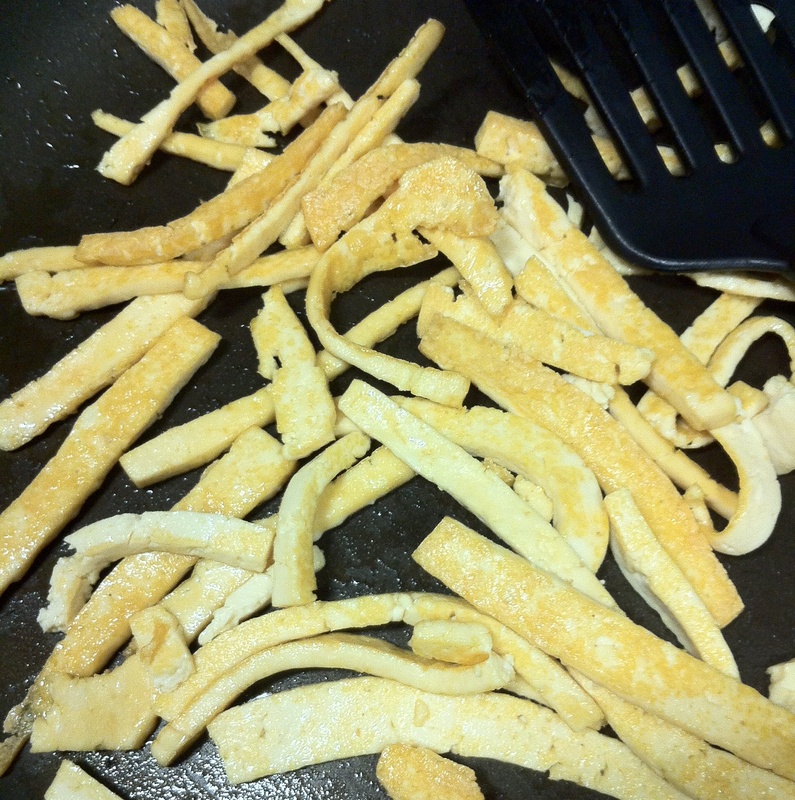 In a large skillet heat 1 tbsp oil and fry tofu on medium heat until golden brown. Turn heat to medium/low and sprinkle nutritional yeast over tofu, stirring so it is well covered. In a small cup mix ingredients from liquid smoke to tamari. Pour liquid smoke ingredients over tofu and cook for five more minutes. Remove tofu from pan and set aside. Do not clean out pan. Add another tbsp of olive oil to the pan and over medium heat saute garlic, shallots, celery and leaves off of one sprig of thyme for five minutes. Add butter and saute until melted. Add mushrooms. Saute for another five minutes. Pour in wine and cook until liquid is evaporated. Sprinkle flour over the top of the mixture and saute for another 10 minutes. While mushrooms are cooking mix better than bouillon with warm water. After mushrooms and flour have cooked for ten minutes slowly stir in water. Add tofu and peas. Bring to a boil. Reduce to simmer and cook for twenty minutes. Cook pasta according to directions. When the twenty minutes are up stir in cashew cream and leaves off the second sprig of thyme. Simmer for five more minutes. Serve over pasta.